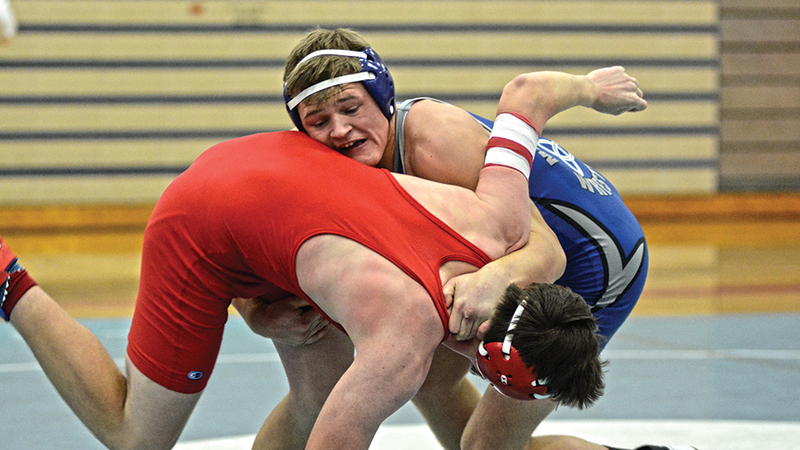 McNary wrestlers going to Reno, Nev.
McNary had four wrestlers place in the top three at the Liberty Invitational on Saturday, Dec. 16 in Hillsboro. At 106 pounds, freshman Grady Burrows took second, winning his first three matches by pin fall. He then earned a technical fall in the semifinals before getting pinned by Cael Morrison, of Dallas, in the first place match. Enrique Vincent cruised through his first three matches at 132 pounds, winning the first two by pin fall and then the third by major decision. However, after losing 5-3 to North Marion’s Russel Stigall in the semifinals, Vincent rebounded with a 6-4 victory in the third place match. At 170 pounds, Brayden Ebbs also won his first three matches, two by pin and one by technical fall to reach the semifinals, where he lost 7-3 to Wilsonville’s Perry Rodenbeck. Ebbs then got another pin in his third place match. After receiving a bye in the first round, Blake Norton pinned his way into the semifinals at 220, where he was pinned by Westview’s Jhamante Woods. Norton earned another pin in the third place match. McNary also had three wrestlers place in the top four in the girls tournament. After losing her first match, Ella Repp earned a pin and major decision to finish third in the 87-96 pound weight class. At 140-149, Nicolette Parra also placed third, getting three pins. Ariel Buik took fourth at 99-110, going 2-2 in the tournament with two pins. On Wednesday, Dec. 27, McNary is leaving for Reno, Nev. to compete in the Sierra Nevada Classic, a double elimination tournament held at the Dec. 28-29 at the Reno Livestock Events Center. “I remember when I was a kid if my coach would have said, ‘Hey, pack up your stuff and we’re going,’ and he could have said anywhere out of town, I don’t care, I was excited to go,” McNary wrestling coach Jason Ebbs said. More than 100 high schools from six states have registered for the tournament. Only nine of the entries are from Oregon. The Celtics next league dual is Thursday, Jan. 4 at home against Sprague and Forest Grove, beginning at 4 p.m.
A single-car crash led to the arrest of two suspects – one each – in the robberies of Shari’s Cafe and Pies and Good Times Grill on River Road North in Keizer. Good Times Grill was robbed by two armed men on Dec. 11. A Shari’s manager was pushed to the ground, and a cash drawer was stolen, on Dec. 7. On Monday, Dec. 11, Sgt. Jeff Goodman responded to the scene of a single-vehicle crash into a utility box in the 3800 block of River Road North. 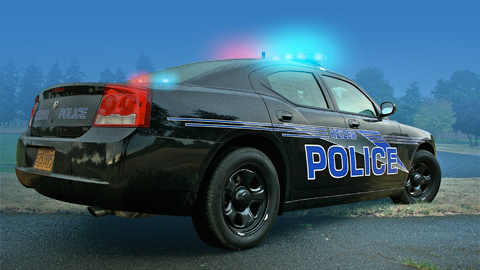 The occupants of the vehicle had already fled the scene, but the license plate matched one sought in connection with other robberies. Some of the occupants were detained near the scene of the crash and officers learned they were staying in the Quality Inn & Suites on Wittenberg Lane Northeast in Keizer. Officers responded to the hotel to follow up on the investigation and recognized another man, Brandon J. Thompson, in the hotel lobby wanted for questioning by the Keizer Police Department’s Criminal Investigations Unit in the Shari’s robbery. Thompson was detained and taken to the police station. Officers eventually ended up searching two rooms at the hotel in connection with the Keizer crimes. Thompson was taken to the Marion County Correctional Facility (MCCF) where he was charged with third degree robbery and theft in connection with the Shari’s robbery. On Thursday, Dec. 14, Keizer officers arrested James A. Libokmeto – a man Det. Chris Nelson said was staying in the Quality Inn with Thompson – and charged him with second degree robbery, third degree theft and violation of probation in connection with the robbery at Good Times Grill. Police are continuing to investigate the incidents and identify additional suspects. The victim at Good Times, a 44-year-old woman who works at the business located at 122 Chemawa Road N.E., told police she was closing up when the first suspect entered and demanded money while pointing a handgun at her. After the first suspect robbed her and fled the business with an undisclosed amount of cash, a second male, also armed with a handgun, emerged from the back of the business, approached the victim and demanded money. After telling the second suspect she had already been robbed by the first suspect, the second man appeared to become confused and then fled. Shari’s was robbed about 8 p.m. on Dec. 7. Witnesses told police that two males entered the restaurant and pushed the manager to the ground before grabbing the drawer from a cash register and fleeing the business. The amount stolen was not disclosed. Anyone having any information about the incident at Good Times incident is asked to contact Keizer Police Department Det. Ben Howden at 503-856-3525. Investigators ask anyone who resides or has a business with security or surveillance cameras in the immediate vicinity of the Good Times Grill to review their recordings to see if either suspect can be seen. Tips can also be submitted by email to [email protected] Persons providing information can remain anonymous, but reference Keizer Police Department incident no. 17-5115 for the Good Times robbery or incident no. 17-5076 for the Shari’s robbery. 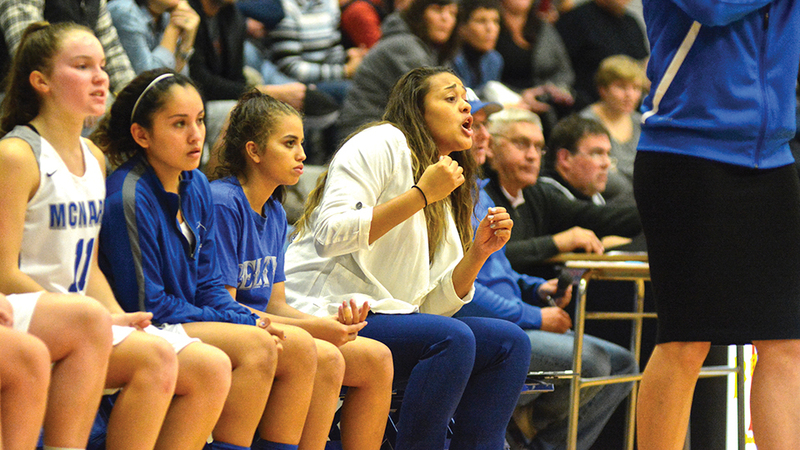 When Elizabeth Doran was named McNary’s head girls basketball coach in April, one former player reached out, making it clear she wanted to return and help the program. After four years at Oregon State University, including a Final Four run in 2016, and then four months playing professionally in Puerto Rico and another four in Finland, Deven Hunter now sits right next to Doran on the McNary bench. Along with assisting the varsity team, Hunter is also the junior varsity head coach. “Right when the coaching job came up, I wanted to be with the program either as a head coach or being an assistant,” said Hunter, who played AAU ball at Oregon Elite with Doran’s younger sister. Making sure the girls have fun is Hunter’s top priority. The Lady Celts have done plenty of winning as well, opening the season 7-0. Hunter, who is also working at the high school as an instruction assistant in the Emotional Growth Center, graduated from McNary in 2012. She averaged 18 points and 11.6 rebounds per game her senior season, leading the Lady Celts to fourth place in the state tournament. At OSU, Hunter finished her career with 893 rebounds, good for fourth in Lady Beavers history. “She had a lot of really cool experiences in college and played for a great coach (Scott Rueck),” Doran said. 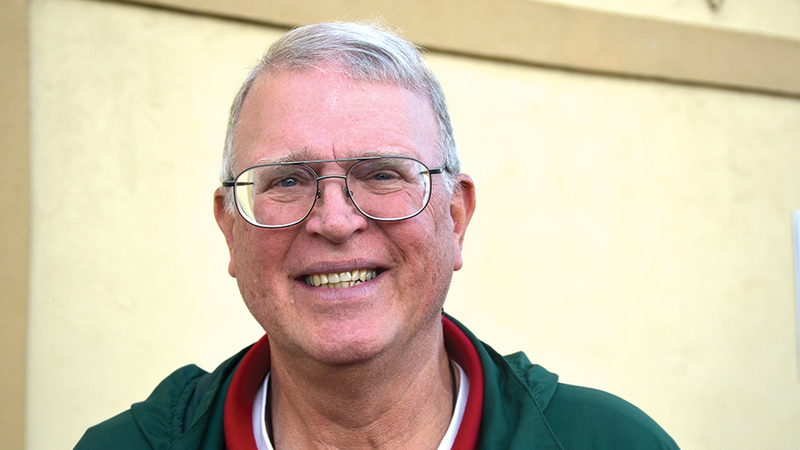 When Jim Johnson became the treasurer for John Knox Presbyterian Church in the late 1990s, he didn’t realize that managing the books for the food bank the church operated was part of the duties. But, it was okay by him. “I couldn’t work at the food bank because I was still employed full-time, but I wanted to be involved,” Johnson said. And, he stayed involved, too. Johnson managed the food bank’s accounts through a name change to the Keizer Community Food Bank and right up until the day the operation became its own non-profit in 2012. Johnson retired from the workforce in early 2017 and, since March, he’s been a regular fixture at the food bank as a volunteer. His time in that role caught the eye of Rev. Curt McCormack, the food bank president. “He never stands around waiting for someone to tell him what to do. That’s the kind of guy you want as a manager because you never ask a volunteer or employee to do something you wouldn’t do yourself,” McCormack said. This fall, Johnson was named as the food bank’s operations manager. “My job is to manage the churches that volunteer and the incoming and outgoing food, and making sure the set-up and tear-down happens,” Johnson said. Since its days as a missionary project of one church, the food bank has grown to encompass congregations from five churches: Clearlake United Methodist, Keizer Christian, John Knox Presbyterian, and Faith Lutheran. The food bank has also expanded services opening its doors to clients twice a week, instead of once. Part of Johnson’s job is simply making sure all hands are on deck when the doors are open. And he could use some extra hands. In addition to helping hand out food or assist clients to their vehicles, volunteers are also needed for food deliveries from the Marion-Polk Food Share on Wednesdays from noon to 2 p.m.
Those interested can contact Johnson at 503-931-7612. The food bank offers supplemental food boxes packed with staples like bread and canned meat as well as bulk items likes beans and cereals. Contents of the box vary from week to week depending on what is being donated locally. While the boxes are not intended to be the sole source of food for clients, the boxes might help a family get through several days. To help provide core foods and extras that not every food bank supplies, McCormack has turned his focus to financial contributions over canned and boxed foods. “If we get a can of soup, we give away a can of soup. If we get $1, we can make it work three times,” McCormack said. Through a partnership with the Marion Polk Food Share, the food bank pays about .30 cents on the dollar for items bought in bulk. The Keizer Community Food Bank was also recently approved for bulk purchases through Dollar Tree. While items still cost $1, it means a bigger bang for those 100 pennies. “We can buy a 62-ounce container of laundry detergent for a buck. We’ve also purchased pet food in 16 ounce boxes that will get a family through a few days,” McCormack said. Such items are rarely donated through other means and can take some of the stress off a struggling family. For more information about the Keizer Community Food Bank, connect with their Facebook page. The Keizer City Council balked at a request to hike fees $10 per field usage at the Keizer Little League complex during its meeting Monday, Dec. 18. The request came from Keizer Little League (KLL), which manages the fields under a contract with the city, and drew sharp rebuke from McNary Youth Baseball (MYB), the former Keizer Youth Sports Association. KLL President Brad Arnsmeier said the fee increase was needed to help maintain the complex, especially in light of recent investment in rejuvenating the facility. While the council ended up requesting more information before making a decision, the ask seemed to renew old animosities between KLL and MYB before the meeting was over. To help make its case, KLL supplied the council with a list of expenses and improvements made during the past year. While expenses totaled more than $15,700 and improvements amounted to $21,700, the list did not include any mention of revenues generated through fees paid by participating families, concession sales, sponsorships or third party field rental. The only income listed at all was the amount paid by MYB last year for field usage, and KLL has been a recent recipient of grants from the Keizer Parks Board and the Rotary Club of Keizer to help pay for the ongoing improvements at the fields. Even as Arnsmeier started making KLL’s case, the size of the increase met with resistance from Mayor Cathy Clark. “It’s a variable increase because it is a fixed rate and that cost for the smallest fields is going up by 33 percent,” Clark said. Under the proposed rate hike, the smallest fields would increase from $30 to $40 per two-hour time slot. The largest field would increase to $60 without the use of lights and to $145 with the use of lights. Arnsmeier said the $10 increase was chosen primarily for ease of accounting. Ryan Walsh, president of MYB, spoke out against the increase. 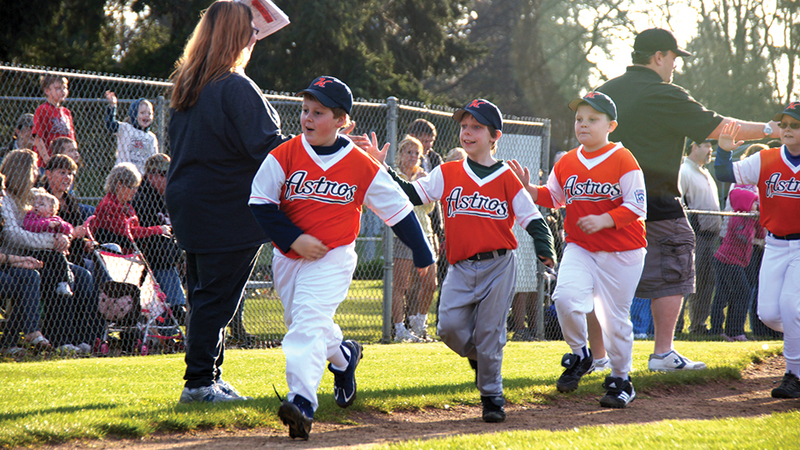 Last year, MYB paid more than $5,700 in field use fees at Keizer Little League Park. Prior to the start of the season, MYB’s reserved spots amounting to nearly $2,000 more, but those were refunded when teams found other venues or were unable to convene a game or practice. “One of my biggest concerns is that third parties using of the field that are offered discounts for the off-season. Maybe we should ask them to pay a bit more than adding it on for our own kids,” Walsh said. Walsh’s other point of contention was that the fee increase was not discussed during a joint board meeting of the two groups in November, and only found out the council would be looking at the issue because of a phone call from City Attorney Shannon Johnson last week. MYB board member Josh DeVos added that the expense would be more difficult to absorb given that MYB had already set its registration rates for the upcoming year. “We decided to move our registrations up and we’ve set our prices for the year already and we’ve worked for months on those costs,” DeVos said. Walsh said increasing the fees would add another $1,900 to MYB’s planned expenses. Arnsmeier responded that the decision to ask for the fee increase wasn’t made until a retreat later in November, and tried to put the onus back on MYB. “The business decision with the free T-ball put them in a bind,” Arnsmeier said. Clint Holland, manager of the concession stand, added that not showing up for reserved times also had an impact on concession sales of up to $120 per empty field slot. At that point, the temperature in the room grew more heated as MYB representatives clamored to respond. However, Clark cut the conversation short. “We need to table this. We need info on true costs and I don’t have enough information on the budgets of both organizations. We don’t have enough information here tonight,” Clark said. Councilor Roland Herrera, who earlier in the evening had backed the request for the increase, walked back his endorsement after hearing from both sides. “I was a KLL guy, but I’m a bigger Keizer guy. I jumped the gun on this and it has to be good for all the kids of Keizer,” Herrera said. KLL has about 450 registered players. MYB has approximately 300. The council plans to look at the issue again on Tuesday, Jan. 16. The McNary Estates Homeowners Association caused a minor neighborhood stir when some residents were asked about religious-themed holiday signage in their yards. It didn’t take long for some residents to start responding to requests to remove the signs on a social media site, nextdoor.com, and the disagreements grew from there. The board has since backed away from the decision to act on sign code enforcement for this holiday season. HOA President Ray Straughan said the five-member board was attempting to respond to objections to some of the signs placed on properties within the north Keizer subdivision, particularly when there were not other “Christmas-y” decorations accompanying it. Straughan said an employee of the HOA was tasked by the five-member board with asking residents whether they knew about Convenant, Conditions, and Restrictions that require McNary Estates homeowners to apply for permission to display signs in their yard, but that wires got crossed in the execution. 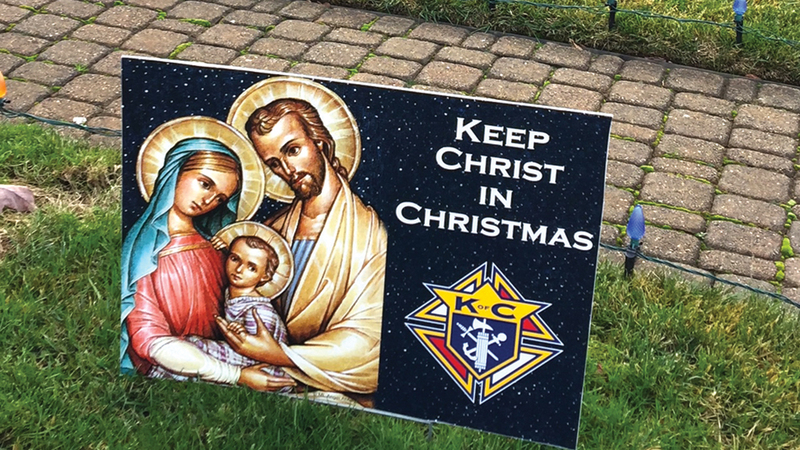 Some residents were contacted last week regarding signs with messages like “Keep Christ in Christmas” and “Christmas Jesus’ Birth – When God Came to Earth” and asked to remove them while other decorations were not singled out as violations. One resident said that, to her knowledge, no one in the neighborhood had ever been approached to remove signs supporting athletic teams, name plates or other common lawn decor. Straughan, in a statement supplied to the Keizertimes, said the intention was for all violations of the signs rules were going to be addressed. In January, the HOA board updated its architectural manual to address “excessive ornamentation,” but the section includes a carve out for seasonal holiday decorations saying only that they must be removed from the property within two weeks after the holiday. Another section of the CC&Rs, which deals specifically with signs prohibits anything larger 18-by-24 inches without permission of the board. Straughan said no one contacted board members about their dissatisfaction before the issue ended up exploding on social media and the intent was only to make residents aware of the language in their HOA contract and to survey the extent of the issue within the neighborhood. Since the notices were made by the employee, the board has still only received one request for permission to leave a sign in place. Asking residents to remove religious-themed signs is contrary to a legal opinion – posted on the HOA website in January 2017 – on the types of sign enforcement allowed under the law. It was prepared by attorney Kevin Harker. “McNary has two options: 1) enforce the sign provision contained in the CC&Rs, or 2) amend the CC&Rs to authorize other types of signs. If the Board decides to enforce its current sign provision in the CC&Rs, it must be done uniformly. In other words, there can’t be an exception for certain types of signs (“Bring the Troops Home”) and a prohibition on others (“Jesus Christ is our Savior”),” the opinion states. The board isn’t taking any further action on the matter, but plans to revisit it in the future, Straughan said. 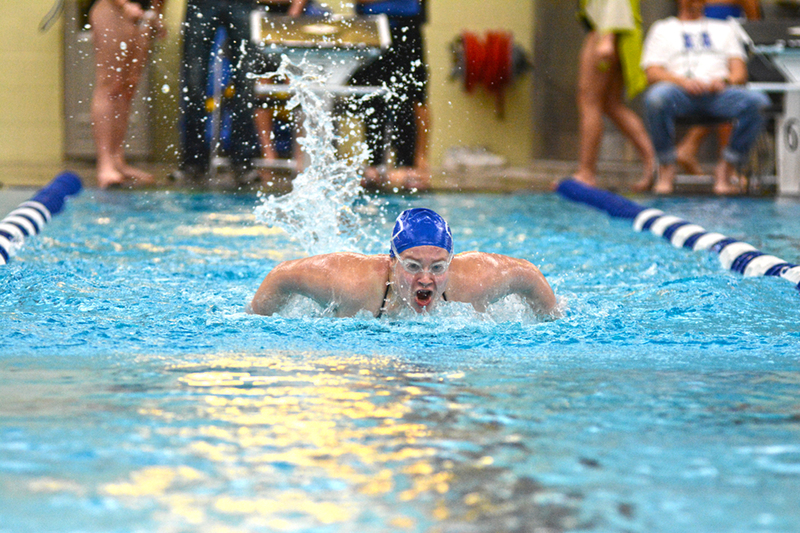 McNary’s girls swim team went into the break with a 97-47 win over Sprague on Thursday, Dec. 14 in the Kroc Center. The Lady Celts won two of three relays. Alex Beard, Bella Beard, Emily Alger and Haley Deban placed first in the 200-yard medley relay in 2:03.70. Hannah Corpe, Emily Alger, Lizzie Bryant and Alyssa Garvey then touched the wall first in the 400 free relay in 4:34.14. Bella Beard won the closest race of the meet, edging Sprague’s Caitlin Evenson 1:15.51 to 1:15.54 in the 100 breaststroke. Bella also finished first in the 500 free in 5:45.32. Alex Beard won the 100 butterfly in 1:11.01. Haley Hughes had the fastest time in the 200 IM, finishing in 3:10.95. Haley Debban set a personal record of 27.09 in the 50 free, which was good enough for second. “We are finally getting into swimming shape and kids are getting comfortable in the pool,” McNary head coach Casey Lewin said. McNary’s boys lost 92-71 to Sprague. The Olympians won all three relays. Harrison Vaughn won the 100 breaststroke in 1:13.58. Kyle Hooper placed first in the 100 fly in 1:05.25. McNary has two weeks off from competition before returning to the pool on Jan. 2 against West Salem. Jo-Ann Audrey Rayner passed away Nov. 25, 2017, at home beside her husband, George, after a lengthy illness. She was the daughter of Audrey and Joseph Bagg (predeceased), mother of Julie, grandmother of Catherine, Jade and Stephanie, great-grandmother of Emily, stepmother to Robert (Norma), Debra (Luis), Linda (Mike) and Steven (Sharon), sister of Mike (Sue) of Courtice, Ontario, Canada, and Sean (Lorena) of La Paz, B.C, Mexico and lifelong best friend of Julie Ridler. Jo-Ann will be remembered by family and friends as loving, caring and generous soul who always thought of others before herself. She will be missed by all who came in contract with her. Jo-Ann was cremated and she will be buried in Ontario, Canada at a later date. A Celebration of Life will be held at that time. A Celebration of Life will be held sometime late winter/spring as the date is to be determined. Assisting is Virgil T. Golden Funeral Service. A modern saying goes: if you’re not growing, you’re dying. It seems to be a guiding principal favored by business, developers and some municipalities. If you don’t have new sources of revenue or new housing tracts, then your organization is on a downward slide. For a city some think that means it will no longer be a desirable address or that business will no longer come knocking. That could be true if a city did absolutely nothing to grow—no new permits, no new subdivisions, no devlopment. But that never happens. Expansion of the Urban Growth Boundary (UGB) has been a talking point for years in Keizer and Salem. The cities share one boundary which is key because the 1970s era law that oversees land use in Oregon states that each UGB needs to have a 20 year supply of land for residential and commerical uses. By most measures Keizer has filled in its part of the shared UGB. Salem has plenty of land inventory in its southern and eastern areas. Unused land inventory in Salem is not the only impediment to expanding Keizer’s boundary—other municipalities are able to weigh in on any expansion discussions, namely Marion and Polk counties as well as the city of Salem. A regional forecast prepared in 2012 by ECONorthwest concluded Keizer would need space for some 2,800 homes by 2030 to meet projected demand, including 1,710 single-family and 1,177 medium and medium-high density housing units. That kind of expansion and development runs right up against one of the gems of our region—the rich soil that fuels Marion County’s agriculture. As one travels north of Keizer on either River or Wheatland roads they are met with acres of land that has been farmed for generations. Thousands of acres of Oregon agricultural land has been rezoned for residential or commercial uses of the past two decades. In our area, Willamette Valley’s farms are as productive as any in the world. The reality is that that land is less valuable for its agricultural uses than its developed uses. How will the city broker any agreement between those who want to retain the area’s agricultural heritage and those who want to bring that land into Keizer and develop it? No major project is undertaken in Keizer without public hearings. Residents will get the opportunity to weigh in on any propsosed expansion and development of Keizer’s urban growth boundary. The question that needs to be answered by residents and leaders is what kind of city does Keizer want to be. Should we do all we can to maintain the quaint small town feel many people think our city exudes and plan for our housing and commercial needs within our current border? Should we be a city that moves with the times, expands and develops into the land north of the city? Or, do we do nothing and let market forces determine what Keizer becomes? It has long been our belief that those who plan for the future also control the future. City planners and leaders need to plan for the future at the same time as considering the concerns of current residents. Traffic in Keizer has been at the top of issues that perplex citizens.While we don’t have Seattle or Los Angeles traffic problems, in our neck of the woods traffic is an issue whether one is driving one mile or 20. That concern would surely grow with zig zaggy development. We are smart enough to realize that more housing brings more people and more people brings more traffic. The city would be transformed for the better if new residents were able to work in Keizer. Working where one lives reduces the need to drive. Planning for future transportation systems will be critical to future development in Keizer. Thankfully Cathy Clark, Keizer’s mayor, is knowledgeable of and intimately involved with regional transportation issues—the city has a very big seat at the table. All of Keizer’s municipal issues have been solved somewhere in the world—we need only look past our exceptionalism and accept that someone else may have solved a housing, workforce or transportation problem. As they say, imitation is the sincerest form of flattery. Maintaining Keizer’s special aura is important to those who call this city home. Will Keizer die if it doesn’t grow? Not immediately, but just like a plant, if it has stopped growing it will age, become brittle and eventually collapse and rot away. It is the duty of leaders in both the public and private sectors to assure the viability of the city for current and future residents. That should include A.) expanding the Urban Growth Boundary in a swath 1000 feet wide along Interstate 5 between Keizer Station and Quinaby Road and zone it exclusively for light industrial and office—that will mean jobs for Keizerites; B.) zone the River Road corridor for mixed used development—retail below, housing above; and, C.) promote improvement and use of public transportation.